During early mouse development, two extra-embryonic lineages form alongside the future embryo: the trophectoderm (TE) and the primitive endoderm (PrE). Epigenetic changes known to take place during these early stages include changes in DNA methylation and modified histones, as well as dynamic changes in gene expression. In order to understand the role and extent of chromatin-based changes for lineage commitment within the embryo, we examined the epigenetic profiles of mouse embryonic stem (ES), trophectoderm stem (TS) and extra-embryonic endoderm (XEN) stem cell lines that were derived from the inner cell mass (ICM), TE and PrE, respectively. As an initial indicator of the chromatin state, we assessed the replication timing of a cohort of genes in each cell type, based on data that expressed genes and acetylated chromatin domains, generally, replicate early in S-phase, whereas some silent genes, hypoacetylated or condensed chromatin tend to replicate later. We found that many lineage-specific genes replicate early in ES, TS and XEN cells, which was consistent with a broadly 'accessible' chromatin that was reported previously for multiple ES cell lines. Close inspection of these profiles revealed differences between ES, TS and XEN cells that were consistent with their differing lineage affiliations and developmental potential. A comparative analysis of modified histones at the promoters of individual genes showed that in TS and ES cells many lineage-specific regulator genes are co-marked with modifications associated with active (H4ac, H3K4me2, H3K9ac) and repressive (H3K27me3) chromatin. However, in XEN cells several of these genes were marked solely by repressive modifications (such as H3K27me3, H4K20me3). Consistent with TS and XEN having a restricted developmental potential, we show that these cells selectively reprogramme somatic cells to induce the de novo expression of genes associated with extraembryonic differentiation. These data provide evidence that the diversification of defined embryonic and extra-embryonic lineages is accompanied by chromatin remodelling at specific loci. Stem cell lines from the ICM, TE and PrE can each dominantly reprogramme somatic cells but reset gene expression differently, reflecting their separate lineage identities and increasingly restricted developmental potentials. After fertilization, the mouse embryo undergoes a series of sequential cleavage divisions producing an eight-cell embryo, where blastomeres maximize their contact with one another in order to generate a compact sphere of cells. Subsequently, apico-basal polarization and asymmetric divisions generate two distinct cell populations at the 16-cell stage: large peripheral polarized cells and small apolar central cells . The outer, polar cells of the late morula change morphology to form an epithelial monolayer of cells - the trophectoderm (TE), which mediates the implantation and initiation of placentation, while the inner apolar cells become the inner cell mass (ICM) and contain the founder cells of the embryo proper. By the early blastocyst stage (E3.5), these two tissues are morphologically distinct - the outer polarized epithelium, the TE, enclosing the ICM, which is itself heterogeneous . Around the time of implantation, cells within the ICM segregate spatially and morphologically into the epiblast (EPI) and PrE lineages, through the migration of PrE cells to the blastocoelic surface of the ICM. Lineage studies have shown that the cells of the EPI are pluripotent and give rise to all tissues of the fetus plus extra-embryonic mesoderm. TE cells are multipotent differentiating exclusively into the trophoblast lineages that form the majority of the fetal placenta, while the PrE give rise to the visceral and parietal endoderm layers that will later line the yolk sack. Besides providing growth support and protection within the uterus, the extra-embryonic TE and PrE are sources of signals to the embryonic lineages to promote correct patterning and differentiation . While the molecular mechanisms underlying the generation of the ICM, TE and PrE lineages are not fully understood, several transcription factors that play a role in the development of these three different lineages have been described, including Oct4, Cdx2 and Gata6, which are critical for the development of the ICM, TE and PrE, respectively [4–6]. An appropriate segregation of the ICM and TE has, in addition, been shown to be dependent upon the establishment and maintenance of cell polarity, involving E-cadherin and the Par3/aPKC complex [7–9]. Studies from several laboratories have provided evidence of global epigenetic differences between these early lineages that may be important in defining their developmental fate. In particular, a recent study has suggested that at the four-cell-stage mouse embryo, blastomeres with higher levels of histone H3 arginine methylation are more likely to contribute to the pluripotent cells of the ICM . Moreover, while the TE (and also the PrE) are hypomethylated both at repetitive and structural gene sequences [11, 12] throughout development, a striking increase in both DNA and H3K9 methylation levels characterizes the ICM at the blastocyst stage [13, 14]. In addition, epigenetic asymmetry between embryonic and extra-embryonic tissues is evident during X-inactivation, which is random in embryonic but imprinted in the TE and PrE lineages [15, 16]. Recently, data from two different sources has provided important insights into how lineage potential is regulated at the earliest stages of mammalian development. Studies comparing DNA methylation at gene promoters in embryonic stem (ES) versus trophectoderm stem (TS) cells, germ cells and fibroblasts identified novel factors that act as 'gatekeepers' for the specification of extra-embryonic tissue  and showed that epigenetic reprogramming, essential for the transmission of pluripotency, occurs within the germline prior to fertilization . Another set of reports, in which the chromatin profile of ES cells, somatic stem cells and their differentiated progeny were contrasted, provided collective evidence that many developmental regulators genes in ES cells are primed for future expression, being marked with histone modifications associated with both active and repressed chromatin [19, 20]. In this study we have examined the epigenetic status of other blastocyst-derived lineages required for the successful development of the early mammalian embryo, using stem cells lines isolated from the TE  and PrE  that self-renew and differentiate into defined extra embryonic tissues (Figure 1A). Our results demonstrate that, following lineage specification to the ICM, TE and PrE, there are predictable changes in the temporal replication and chromatin structure of lineage-determining genes, as reflected in the stem cell lines analysed here. 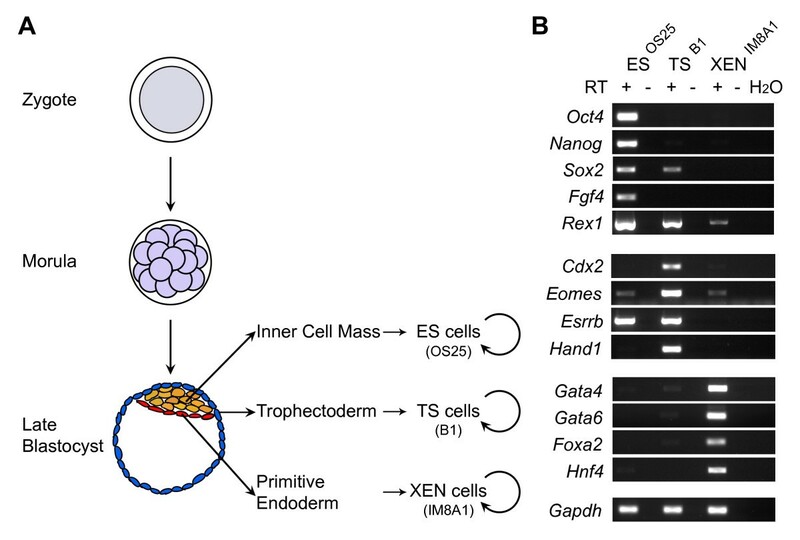 We also show that extra-embryonic endoderm (XEN) and TS cells, like ES cells, can dominantly reprogramme somatic cells (human lymphocytes), but that they initiate discrete and different lineage-specific gene expression programmes. Taken together, these results suggest that dynamic changes in chromatin organization occur within the developing blastocyst and that these epigenetic changes are important for cell specification and conveying lineage identity. Embryo-derived stem cell lines respectively express lineage-associated markers. (A) Brief schematic representation of mouse pre-implantation development and origin of lineage-derived stem cells. Embryonic stem (ES), trophectoderm stem (TS) and extra-embryonic endoderm (XEN) can be derived from the inner cell mass (yellow), trophectoderm (blue) and primitive endoderm (red) of mouse blastocysts. (B) Reverse transcription polymerase chain reaction expression analysis of ESOS25, TSB1 and XENIM8A1 cells lines. RNA was isolated and cDNA prepared from all three embryo-derived stem cell lines cells and analysed using primers for Oct4, Nanog, Sox2, Fgf4, Rex1, Cdx2, Eomes, Esrrb, Hand1, Gata4, Gata6, Foxa2, Hnf4 and Gapdh as a loading control. +/- indicates presence or absence of reverse transcriptase; H2O, water control. Reverse transcription polymerase chain reaction (RT-PCR) was used to assess the relative abundance of different mRNA transcripts in ES (OS25, ), TS (B1, ) and XEN (IM8A1, ) cell lines. Consistent with previous reports, ES cells expressed Oct4, Nanog, Sox2, Fgf4, Rex1  and Esrrb , TS cells expressed Cdx2, Eomes, Esrrb and Hand1 , and XEN cells selectively expressed Gata4, Gata6, Foxa2 and Hnf4  (Figure 1B and Additional file 1). Rex1 transcripts were detected in all three cell types but were most abundant in ES cells; Sox2 transcripts were detected in both ES and TS cells; Eomes transcripts were detected in all three cell types but were most abundant in TS cells. These data show that each of the stem cell lines displays a different profile of gene expression, in line with previous studies [21, 22, 24] and with their different origins. At the level of specific genes, however, there is considerable overlap in expression between the cell lines. In order to directly compare the epigenetic profiles of extra-embryonic stem cell lines with those of pluripotent cell lines, we initially assessed the replication timing of a panel of developmental genes in OS25, B1 and IM8A1 cell lines. Genes include those that encode transcription factors regulating the specification of germ layers in the embryo , as well as those encoding transcription factors that are important for the biology of early embryonic ICM, TE, PrE and EPI lineages. Replication was assessed using a previously established assay [26, 27] in which asynchronous cells are pulse-labelled with 5-bromo-2-deoxyuridine (BrdU), fractionated according to cell-cycle stage (see Additional file 2, part A) and the relative abundance of newly synthesized locus-specific DNA is compared between successive cell cycle fractions using quantitative PCR. Although the exact relationship between chromatin structure and replication timing is not fully understood, early replication is a characteristic of 'accessible' and highly acetylated chromatin while late replication is a feature of heterochromatic domains and some repressed genes . 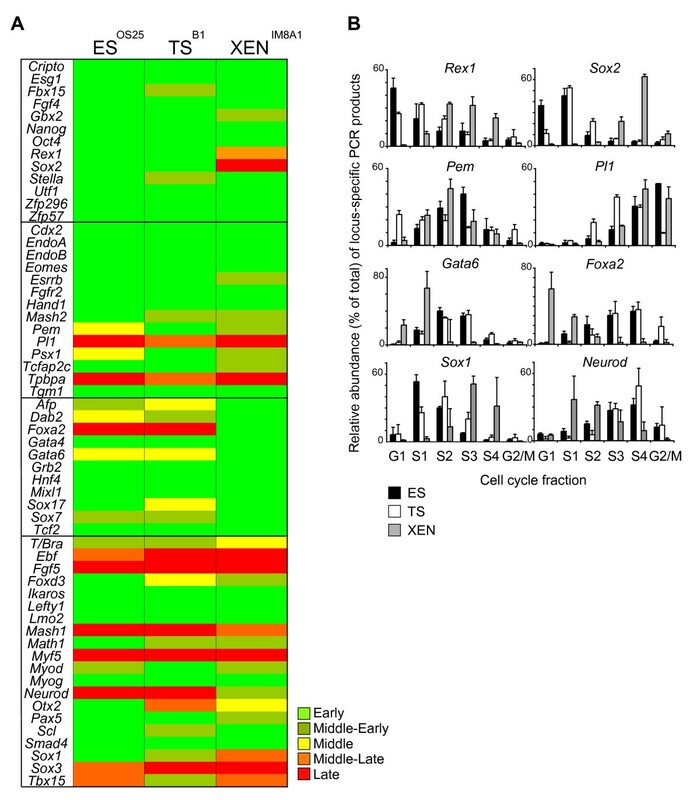 Consistent with this, α-globin a constitutively early replicating gene, was detected in S1 fractions isolated from ES, TS and XEN cells (Additional file 2, part B top panel), while Amylase 2.1, a late replicating control, was detected in S3 and peaked in the S4 fractions in all three cell types (Additional file 2, part B middle panel) . Detection of similar levels of BrdU-labelled Gbe DNA in cell cycle fractions that were 'spiked' with a constant amount of Drosophila BrdU-labelled DNA (Additional file 2, part B lower panel), confirmed an equivalent recovery of immuno-precipitated DNA in all analyses shown. The replication times of candidate genes were determined from at least two independent experiments, scored according to a peak abundance of locus-specific DNA (in G1/S1 [early], S2 [middle-early], S2 and S3[middle], S3 [middle-late] or S4/G2 [late]) and the results were colour-coded to facilitate comparison (see Figure 2, as previously described [19, 27]). Embryonic stem (ES), trophectoderm (TS) and extra-embryonic endoderm (XEN) cell populations have distinct replication timing profiles, which reflect their lineage potential. (A) Summary of the replication timing comparison of the selected candidate genes between the three embryo-derived stem cell lines. The replication timing of each gene was defined according to its peak abundance in G1/S1 (early, dark green), S2 (middle-early, light green), S2 and S3 (middle, yellow), S3 (middle-late, orange) or S4/G2 (late, red), determined in at least two independent experiments. Inner cell mass/ES-, TE/TS-, PrE/XEN-related loci or genes involved in the specification of somatic cell types are grouped into four different boxes. (B) Histograms comparing the relative abundance of locus-specific signal for Rex1, Sox2, Pem, Pl1, Gata6, Foxa2, Sox1 and Neurod loci within each cell cycle fraction for ES (black bars), TS (white bars) and XEN (grey bars) cells as assessed by quantitative polymerase chain reaction. Mean and standard deviation of two or more experiments are shown for each cell type analysed. Most of the genes analysed replicated in early (or middle-early) S-phase in all three stem cell lines (44, 44, 45 out of 58 genes in ES, TS and XEN cells, respectively, Figure 2A). These included a subset of ICM-associated genes (Oct4, Nanog and Fgf4) expressed by ES cells, as well as genes associated with TE (Cdx2 and Hand1) and PrE (Gata4 and Hnf4). In addition, many genes that are not thought to be expressed at significant levels in any of these cell types, for example Math1, Scl and Myog, replicate early in all three embryonic stem cell lines. These data suggests that in TS and XEN cells, many developmental regulator genes remain 'accessible' - as reflected by the prevalence of early replicating loci - similar to that reported previously for ES cells . Overall, the replication timing profiles of ES and TS cells were similar (41/58) or identical (32/58), while XEN cells showed a greater disparity. This is illustrated by a delayed replication of several pluripotency-associated genes in XEN cells (for example, Rex1 and Sox2) and the early replication of PrE-associated genes Gata6 and Foxa2 (Figure 2B) and is in keeping with the idea that some tissue-specific genes may replicate earlier when transcriptionally active [29, 30]. Similarly, Pem and Psx1, which encode factors required for extra-embryonic lineages, replicated later in ES cells as compared to TS and XEN cells and the replication of Pl1, a TE-specific factor, was selectively advanced in TS cells (Figure 2B). These results were confirmed by analysing additional independent TS and XEN cell lines (Additional file 1) that were derived from mice carrying floxed Dicer alleles . Comparing TSB1 and TSDicerfx/fx or XENIM8A1 and XENDicerfx/fx (Figure 2 and Additional file 1), as well as numerous different ES cell lines [19, 32], confirmed that the replication timing profiles of different embryonic and extra-embryonic cell lines were robustly preserved. Interestingly, the neural-associated genes Sox1 and Neurod that are not expressed by any of the embryonic stem cell lines, showed clear differences in replication timing between ES, TS and XEN cells (Figure 2B, lower panel). Sox1 replication was advanced in ES cells while Neurod replicated early in XEN cells. Although unexpected, these results suggest underlying changes in the chromatin context of these genes in the stem cell lines. In the case of Neurod, although the transcription factor is known to function in neuronal development, it has also been shown to have an important role in the development of specialized cell types arising from the gut endoderm . Despite being derived from the EPI and not from the PrE, gut endoderm cells have morphological and functional similarities to visceral endoderm cells . The advanced replication of Neurod in XEN cells might therefore reflect changes in transcriptional competence at the locus that is associated with an affiliation to the 'endoderm' lineage. The chromatin profile of important regulator genes was compared between embryo-derived stem cell lines using chromatin immunoprecipitation (ChIP) in order to evaluate the abundance of specific histone modifications that are associated with either active (H3K4me2, H4ac and H3K9ac) or repressed (H3K27me3 and H4K20me3) chromatin. For these analyses primers were designed to recognize the promoter region (up to 600 kb upstream the transcriptional start site) of each candidate gene; genes that are known to be abundantly expressed by each cell type were used as positive controls for 'active' chromatin marks. Pericentric heterochromatin (γ-satellite repeats) provided controls for H4K20me3 immuno-precipitations, H3K27me3 was validated by analysing known bivalent loci in ES cells , and the abundance of modified histones was calculated relative to histone H3. As anticipated, the promoters of many genes that are overtly expressed in ES cells (shown in bold, Figure 3, upper panel), as well as many bivalent genes (including Eomes, Fgf5, Foxd3, Mash1, Math1, Sox1 and Tbx15) were enriched for H3K4me2, and/or H3K9ac and H4ac at their promoters [19, 20]. Exceptions included the promoters of Tpbpa and Pl1, two markers of differentiated trophoblast. In ES cells histone H3K27me3, a modification catalyzed by polycomb repressor complex 2 (PRC2), was abundant at the promoters of genes that were either not expressed or expressed at low levels, including TS-associated genes (Cdx2, Eomes, Pem, Psx1), PrE-associated genes (Gata6, Foxa2) and genes that are normally expressed by subsets of differentiated tissue (such as Mash1, Math1 and Neurod) (shown in purple in Figure 3). Some silent late-replicating genes showed only low levels of H3K27 trimethylation (Tpbpa and Pl1) suggesting that these genes, in contrast to bivalent genes, are not developmentally 'poised' in ES cells and may, therefore, require extensive chromatin-remodelling for correct developmental expression. Levels of promoter H4K20me3 (shown in red in Figure 3), a mark associated with mammalian pericentric heterochromatin , were modest in ES cells with the exception of Sox2 (an observation that is likely to reflect the fact that OS25 cells carrying Sox2 as a transgene). In TS (B1) and XEN (IM8A1) cell lines, in contrast to ES (OS25), H4K20me3 was detected at the promoters of many genes and was particularly enriched at several silent genes in XEN cells (Sox2, Foxd3, Sox1) (Figure 3, see Additional file 3 and Figure 1A for expression data). Taken as a whole these ChIP analyses suggest that, although the promoters of many development regulator genes are co-marked with histone modifications associated with active (acetylated, H3K4me2) and repressive (H3K27me3) chromatin in both ES and TS cells, this is not the case in XEN cells. Rather, in XEN cells histone marks that characterize accessible chromatin genes tend to be restricted to genes that are productively expressed at high (Gata6, Foxa2, Pem, Psx1) or moderate levels (Eomes, Fbx15, Rex1, Tbx15). The exception to this generalization is Math1 (lower panel of Figure 3 and Additional file 3), a promoter that is enriched for H3K4me2 in ES, TS and XEN cells and, therefore, appears to retain a bivalent (or poised) configuration. Although we do not currently know the cause or significance of this single observation, collectively our data suggest that the chromatin structure of many genes is different between the stem cell lines, supporting earlier proposals that epigenetic reprogramming occurs in embryonic and extra-embryonic lineages during early mouse development [17, 18]. Histone modifications at the promoters of key developmental regulator genes in embryonic stem (ES), trophectoderm stem (TS) and extra-embryonic endoderm (XEN) cells. The abundance of active [histone 3 lysine 4 dimethylation (H3K4me2, yellow bars), histone 4 acetylation (H4ac, blue bars), histone 3 lysine 9 acetylation (H3K9ac, white bars)] and repressive [histone 3 lysine 27 trimethylation (H3K27me3, purple bars), histone 4 lysine 20 trimethylation (H4K20me3, red bars)] histone marks at selected loci was assessed in ES, TS and XEN cells by chromatin immunoprecipitation and quantitative polymerase chain reaction. Values are shown as the ratio of modified histone H3 to unmodified histone H3 immunoprecipitations and normalized to an abundantly expressed gene in each cell type; Oct4 in ES cells, Cdx2 in TS cells and Gata6 in XEN cells. Detected transcripts are highlighted in green while overt gene expression is shown in bold green. Primers were designed to the promoter region (100-600 bp upstream the transcriptional start site). Error bars represent the standard deviation of three independent experiments. Spontaneous and experimental cell fusions between ES cells and cells from a range of somatic tissues result in the nuclei of differentiated cells being reprogrammed to express an ES-specific gene expression pattern (so-called dominant reprogramming) [36, 37]. Although the rules of dominance are not fully understood, other stem cell populations, including embryonic germ and embryonic carcinoma cells, can also reprogramme somatic cells towards a pluripotent state in vitro [38, 39]. In order to establish whether extra-embryonic stem cell populations have this capacity and, moreover, whether reprogramming by these extra-embryonic cells induces the de novo expression of different cohorts of genes, we tested the ability of TS and XEN cells in order to reprogramme human B cells using a previously established assay system . Briefly, mouse stem cells and human B-lymphocytes were mixed in a 1:1 ratio and inter-species heterokaryons (cells in which parental nuclei share the same cytoplasm but remain spatially separate) were generated by polyethylene glycol (PEG)-mediated cell fusion. Human B cell reprogramming within these heterokaryons was assessed 1 to 3 days after fusion, by qRT-PCR using primers that were designed (and validated) to specifically amplify human transcripts. 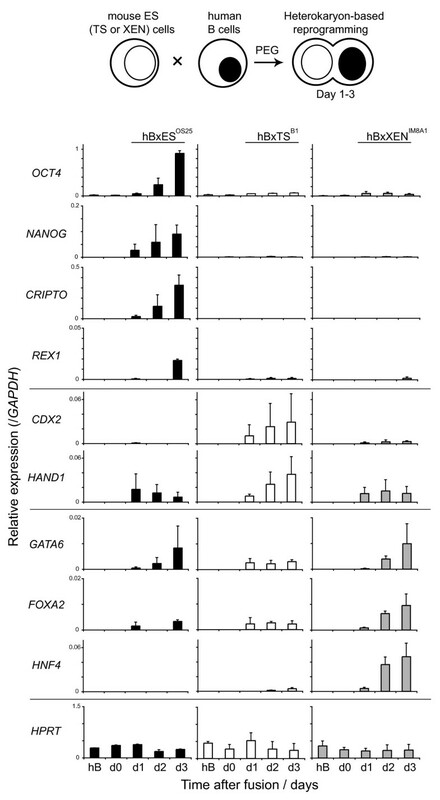 Expression of HPRT served as a positive control in these analyses and transcripts derived from the human pluripotency-associated genes (OCT4, NANOG, CRIPTO and REX1), TE (CDX2 and HAND1) and PrE-associated genes were examined in detail (GATA6, FOXA2 and HNF4) (Figure 4). Human B cells (hB) did not express detectable levels of pluripotency-associated transcripts prior to fusion, but following heterokaryon formation with mouse ES cells (hBxES), expression of OCT4, NANOG, REX1 and CRIPTO was initiated and increased up to day 3 (Figure 4, upper panel left). Fusion of hB with mouse TS (B1) or with mouse XEN (IM8A1) cells did not induce the expression of any of the human pluripotency-associated genes tested, including CRIPTO. This could be considered surprising as XEN (IM8A1) cells express high levels of mouse Cripto transcripts (several fold more than ES cells) and both TS and XEN cell lines express mouse Rex1 (Additional file 4). In heterokaryons formed between hB and TS (B1), expression of TE-associated genes (CDX2 and HAND1) was induced, as well as low levels of some PrE-associated genes (GATA6 and FOXA2). Fusions between hBxXEN cells resulted in a rapid and sustained induction of GATA6, FOXA2 and HNF4 (Figure 4). In contrast, mouse lymphocyte-specific transcripts (such as CD19, CD37 and CD45) were not detected throughout these experiments (data not shown) which is in line with the dominance of embryonic and extra-embryonic stem cells in reprogramming. These results collectively show that XEN and TS stem cell lines, like ES cells, retain a capacity to dominantly reprogramme somatic cells, but impose a programme of gene expression that is consistent with their different lineage affiliations. Lineage restricted dominant reprogramming of human lymphocytes by embryo-derived stem cells. The reprogramming activity of embryonic stem (ES), trophectoderm stem (TS) and extra-embryonic endoderm (XEN) cells was assessed by heterokaryon formation with human B-lymphocytes (hB). Relative expression levels of human stem cell-specific genes in interspecies heterokaryons were detected by quantitative reverse transcriptase polymerase chain reaction analysis. The transcript levels of ES (OCT4, NANOG, CRIPTO, REX1), TS (CDX2, HAND1) and XEN-specific (GATA6, FOXA2 and HNF4) genes were measured 1 to 3 days after fusion and normalized to GAPDH expression. The constitutively expressed gene HPRT was included as a control. Values shown are the mean from two independent experiments and error bars indicate standard deviations. In this study we show that stem cell lines derived from the ICM, TE and PrE, display distinct epigenetic properties as defined by replication timing, chromatin profiling and reprogramming potential. However, our studies revealed that many genes that are important in determining cellular fate are retained in an 'accessible' chromatin state (acetylated and early replicating) in trophoblast-restricted stem cells (TS), being co-marked also by PRC2-mediated H3K27me3. This chromatin configuration, often referred to as 'bivalent', is shared with ES cells [19, 20] and results in non-productive gene expression [41, 42]. It is thought to be important for priming specific cohorts of genes for future developmental expression [19, 43, 44], and may therefore be important for restraining differentiation [41, 45, 46]. In keeping with this idea, our data show that few developmental regulator genes appear to be primed (bivalent) in XEN cells as compared with ES or TS cells, perhaps reflecting their narrower developmental potential. In addition, the delayed replication of several neuronal-associated genes in XEN cells relative to ES (for example Otx2, Sox1 and Sox2), infers a change in chromatin status and the loss of promoter acetylation. Similar delays have been reported in mature B and T-lymphocytes , which, like XEN cells, have a more restricted (non-neuronal) fate and also in the case of F9 embryonic carcinoma cells, which show a propensity to differentiate to endoderm lineages . Interestingly, Sox1, Sox2 and the neural crest marker Foxd3 also display high levels of H4K20me3 levels at their promoters in XEN cells, consistent with reduced transcriptional competence. The exception to this general trend is Math1, a gene that appears to be functionally primed in XEN cells being simultaneously enriched for 'active' histone marks (H3K4me2, H3K9ac and H4ac) as well as 'repressive' PRC2-mediated H3K27me3. As this gene is known to be involved in the generation of the secretory cell lineages in the intestine  that are derived from the definitive endoderm, it is conceivable that Math1 has a conserved role in the development of extra-embryonic endoderm lineages. Consistent with this idea, XEN cells exhibit a strong bias to form parietal endoderm in chimeras, a tissue which is highly specialized for the synthesis and secretion of extracellular matrix proteins [22, 49]. The similar histone modifications and replication timing profiles between ES and TS cells is consistent with mounting evidence indicating that only relatively few genes are uniquely restricted to the placenta, the vast majority of candidate TS-associated genes being involved in the development of other organs within the embryo proper . Some genes such as Oct4 and Nanog, which are downregulated in TS cells (but remain early-replicating), probably rely on alternative epigenetic mechanisms to suppress transcription in extra-embryonic lineages. For example, in TS cells Oct4 and Nanog regulatory domains are hyper (DNA) methylated and hypoacetylated, relative to ES cells [51, 52]. Despite the overall similarity between ES and TS, the use of a candidate-based replication timing assay allows loci that are subject to chromatin re-modelling events early in mammalian development to be readily identified. A number of studies have suggested that the generation of the ICM and TE requires the development of cell polarity in the outer cells of the morula, and the linked asymmetric divisions of blastomeres at the eight-cell-stage . The significance of this polarization event is reflected by the identification of loci involved in cell polarity and cytoskeleton dynamics among candidates that replicate earlier in TS cells than in ES cells (such as Epb4.1l3, Fez2 and Cdh5, data not shown) in addition to Dab2, which are likely to be functional relevant for the biology of the trophoblast lineage. The reprogramming properties of extra-embryonic stem cells have, to our knowledge, received little attention. Here, experimental heterokaryons were generated to ask whether TS and XEN cells were capable of dominant reprogramming human somatic cells and, if so, whether they could impose different lineage-specific gene expression programmes. We demonstrate that TS and XEN cells reprogramme human B-lymphocytes in order to establish TE- or PrE-specific gene expression, respectively, albeit at low levels. As these fusions were performed using cells from different mammalian species, low expression levels may reflect inter-species differences, such as mismatches between mouse factors and cis acting elements within human genes . Despite this, fusions using ES, TS or XEN cells reprogrammed human lymphocytes differently, the outcome reflecting discrete lineage affiliations. Interestingly, the expression of human transcripts by reprogrammed B-cell nuclei was not identical to that produced by the mouse stem cell eliciting the dominant reprogramming. This observation mirrors previous reports that fusion with mouse ES cells, results in human B cells expressing a human ES-specific gene expression profile (hSSEA4, hFGF2 and hFGFR1), while hallmark factors of mouse ES cells, such as Lif receptor and Bmp4, are not activated . In this context, it seems likely that reprogrammed hB cells display features of human extra-embryonic-specific gene expression upon heterokaryon formation with mTS or mXEN cells, in agreement with published data . Since extra-embryonic derived human stem cell lines have not been fully characterized, the generation of heterokaryon and hybrid cells using this approach could provide an important tool for studying human extra-embryonic lineages. This report provides a preliminary epigenetic characterization of mouse TE and PrE extra-embryonic lineages using stem cell lines as a model. We provide evidence of qualitative differences in the chromatin profiles between embryo-derived stem cell lines that accurately reflect their different transcriptional, lineage commitment and developmental potentials. These data support previous in vivo studies of pre-implantation stage embryos [13, 14], showing that dynamic changes in chromatin occur at the earliest stages of mammalian development and are likely to be important for refining cellular potential. ES cells (OS25) were maintained in an undifferentiated state on 0.1% gelatin (StemCell Technologies, Vancouver, Canada)-coated flasks (Fisher Scientific UK Ltd, Leicestershire, UK) in G-MEM-BHK 21 medium (Invitrogen Ltd, Paisley, UK) supplemented with 10% fetal calf serum (FCS; PAA Laboratories, Gmbh, Pasching, Austria), non-essential amino acids, sodium pyruvate, sodium bicarbonate, antibiotics, L-glutamine, β-mercaptoethanol (Sigma-Aldrich Co Ltd, Gillingham, UK) and ESGRO-LIF (1000 U/ml) (Chemicon/Millipore, Billerica, USA). TS cell lines (B1 and Dicerfx/fx) were cultured in the presence of 70% mitotically inactivated mouse embryo fibroblast cells-conditioned medium and 30% TS medium to which human recombinant Fgf4 (25 ng/ml) (Sigma-Aldrich) and heparin (1 μg/ml) (Sigma-Aldrich) were added. The TS cell medium was RPMI 1640 supplemented with 20% FCS (GlobePharm, Cork, Ireland), sodium pyruvate, β-mercaptoethanol, L-glutamine and antibiotics. XEN cell lines (IM8A1 and Dicerfx/fx) were maintained on 0.1% gelatin-coated flasks in RPMI 1640 supplemented with 20% FCS (GlobePharm), sodium pyruvate, L-glutamine, antibiotics and β-mercaptoethanol. EBV-transformed human B-lymphocyte clones were maintained in RPMI medium supplemented with 10% FCS (GlobePharm), L-glutamine and antibiotics. All cell lines used in this study were subjected to karyotypic analysis to check chromosome number. XEN cell lines routinely contained 40-46 chromosomes consistent with their previously reported aneuploid status  while ES and TS cell lines appeared normal. RNA extraction from ES, TS, XEN cells and heterokaryons was performed using RNeasy protect mini kit (Qiagen, USA) and RNase-free DNase set (Qiagen) for digestion of residual DNA. Total RNA (2.5 μg) was then reverse transcribed using the Superscript first-strand synthesis system (Invitrogen) and cDNA of interest amplified in a total reaction volume of 50 μL using 500 nM primers, and 1.25 U of HotStarTaq (Qiagen). The PCR cycling conditions were as follows: 95°C for 2 min, 30 cycles 95°C for 30 s, annealing at 60°C or 65°C for 30 s and elongation at 72°C for 2 min, finishing with a step at 72°C for 10 min. BrdU-labelling, ethanol fixation, cell cycle fractionation by flow cytometry and isolation of BrdU-labelled DNA by immunoprecipitation were carried out as previously described  with the same BrdU-pulse labelling time for all three stem cell populations (30 min). The abundance of newly replicated DNA in each cell-cycle fraction was determined by real-time PCR amplification. Real-Time PCR analysis was carried out on a Opticon™ DNA engine (MJ Research, Inc, MA, USA) under the following cycling conditions: 95°C for 15 min, 40 cycles at 94°C for 15 s, 60°C for 30 s, 72°C for 30 s followed by plate read. PCR reactions were performed in a 30 μL reaction volume containing 2× SYBR Green (Qiagen), 1.5 μL of template and 300 nM primers. Each measurement was performed in duplicate. For heterokaryon analysis data were normalised to human GAPDH expression. Exponentially growing ES, TS and XEN cells were processed for ChIP analysis as described previously . 140 μg chromatin was subjected to immunoprecipitation with 5 μL anti-H3K9ac (Upstate Biotechnology, NY, USA), 5 μL anti-H3K4me2 (Upstate), 5 μL anti-H4ac (Upstate), 5 μL anti-H3K27me3 (Upstate), 5 μL anti-H4K20me3 (Upstate), 2.5 μL of a rabbit anti-mouse-IgG antiserum (negative-control) (Dako Inc, CA, USA) and 4 μL of anti-H3 (Abcam, MA, USA). After purification, DNA was resuspended in 80 μL TE solution. Quantification of precipitated DNA was performed using real-time qPCR (quantitative PRC) amplification. Histone's modification levels were normalized against total H3 detected and the ratio of modified-H3 to H3 was denoted as relative enrichment. ChIP experiments were performed twice. Heterokaryons were generated by fusing either mouse ES, TS or XEN cells and human B-lymphocytes using 50% polyethylene glycol, pH 7.4 (PEG 1500, Roche, Hertfordshire, UK). Equal numbers of stem cells and B-lymphocytes were mixed, washed twice in phosphate buffered saline at 37°C and 1 mL of PEG at 37°C was added to the pellet of cells over 60 s followed by an incubation at 37°C for 90 s. Cell mixtures were washed with 10 mL of DMEM at 37°C added over 3 min. After centrifugation the pellet was allowed to swell in complete medium for 3 min before resuspension. In order to eliminate non-fused hB cells Ouabain (10-5 M) was added to the medium. Proliferating stem cells were eliminated by the addition of 10-5 M Ara-C 6 h after fusion and then removed after 12 h. Fused cells were cultured under conditions promoting the maintenance of undifferentiated mouse stem cells. We thank Austin Smith, Neil Brockdorff and Janet Rossant for ES, TS and XEN cell lines, respectively. We are also grateful to Tatyana Nesterova for help and advice with TS cell culture and Eric O'Connor and Eugene Ng for FACS sorting. This work was supported by the Medical Research Council, UK. JS was supported by a doctoral grant from Fundação para a Ciência e a Tecnologia, Portugal. JS and CFP contributed equally to this work. JS carried out the experiments with help from OA and analysed the data. CFP carried out the reprogramming and revision experiments with help from AD, TS and TR. VA, MM and AGF participated on the design of the study. All authors have read and approved the manuscript.